Jaspinder Bhatia is the COO of Brandappz & Smartevents. Here, she shares the transformation effects of the Semi Precious Gemstone-Peridot and the impact it had on her career and business. Gemstoneuniverse today is only organization where you can hear real certified Video Shares of people whose profiles you can verify at LinkedIN. Have a similar story to inspire-Get in touch with us today. To view more verified Video Shares of success with Jyotish Gemstones please click here. To find out your Lucky Gemstones as per your birth chart for career please click here. Ravan from Siya Ke Ram & Ashwini Nakshtra Fame Superstar JK a Gemstoneuniverse Patron speaks about Gemstones & Astrology Power! 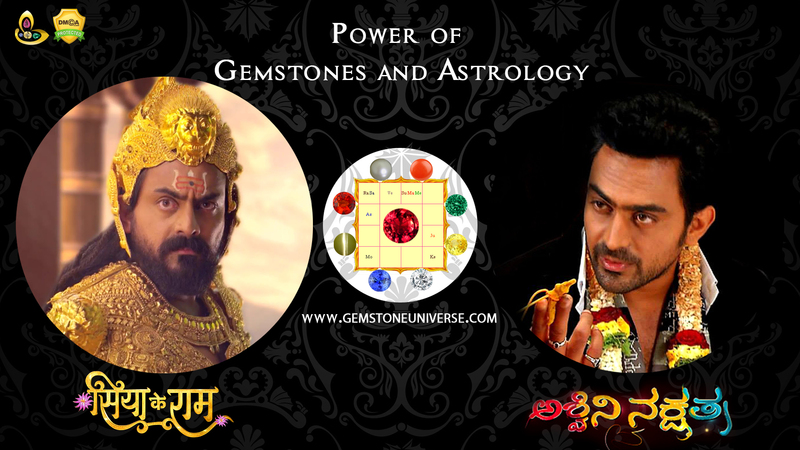 Ravan from “Siya Ke Ram” & Ashwini Nakshtra Fame “Superstar JK” a Gemstoneuniverse Patron, speaks about Gemstones & Astrology Power! The gemstones helped him in his career & this is what he has to say: Connect with us today and turbo charge your life. Mr. Karthik Jayaram fondly called as “JK” is a structural engineer turned actor. 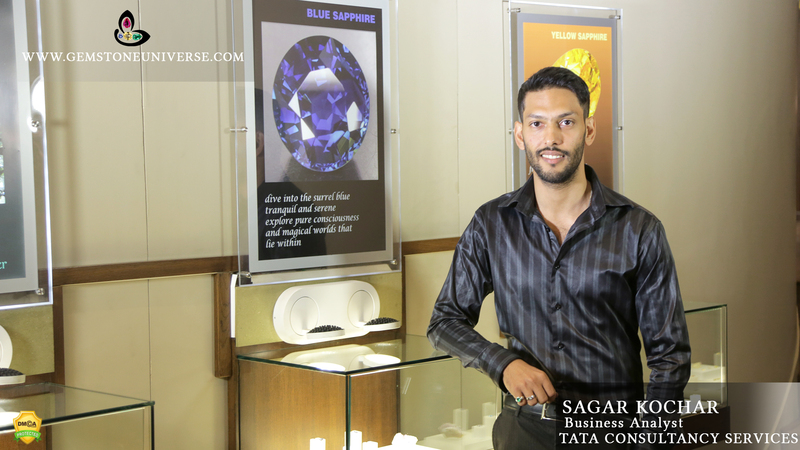 Here in this video is shares his experience and journey with Gemstoneuniverse and the power of Astrology and Gemstones that assisted him in reaching the next level in his career. We welcome you to experience the power of true Jyotish Gemstones with Gemstoneuniverse-The Gold Standard in Planetary Gemology. The past 20 years at Gemstoneuniverse have been fascinating. In our quest for a 100% error free gem therapy and standing by the principles of the classic Do Gemstones work- No they don’t for 90% of the people we have empowered individuals worldwide to implement gem therapy with true Jyotish Gemstones with terrific results. In majority of the cases the objectives of the individuals seeking solutions or empowerment by Gem therapy are highly complex, intimate and confidential and it is quite rare that someone will speak quite openly regarding what exactly happened by wearing the gemstones. The case of Mr. Rajkumar Tulshayan featured in the write up Celebration of a Miracle is an exceptional one. However, some individuals who really had a good effect post wearing the gemstones are now coming forward and sharing the changes that they have experienced. As per the Gemstoneuniverse Tradition of transparency we had only one condition put forth to the individuals that we will feature only those shares with verifiable names and designations that can be validated by the viewers and community that visit Gemstoneuniverse and some of the individuals were very gracious and courageous enough to do that. It is not easy to face the camera neither it is easy to share about something as personalized as Gem Therapy. We thank these individuals humbly for their shares will surely impact the Karmik Life Map of somebody positively and in turn impact their own Karmik Life map positively. You can view some of the shares here. For new visitors who are not aware of what Gemstoneuniverse is and what we do we request you to please read the About Us page that can be accessed by clicking here and please respect the privacy of those who had the calling and courage to come forth and share their honest opinions. – There are many priests of Temples also suggesting Gemstones and most of them pretty much suggest the same gemstones. That would fall in the category of Incorrect Recommendation and Incorrect Gems in the Do Gems work article. – He shares that either you can work hard and expect the best or you can work hard and take your level higher by trying out therapies like Gem therapy. You will not know about something till you try it. Important points Sagar- Surely, you are a good analyst. If you are a Gemstoneuniverse patron and would like to share your story with your name and designation do connect with us and we shall facilitate that. If privacy and anonymity are of importance to you, then you can still share your story under any screen name On Trustpilot that lets you be anonymous but validates your entry. The power of true Jyotish Gemstones is truly terrific. What is a miracle for our patron is an everyday occurrence for us at Gemstoneuniverse and this excitement of powerful results and being a part of another human’s journey in a positive manner keeps us centred to our vision. Dear Gemstoneuniverse Website Visitor, Patron and Astrology Gemstone Lovers, as one year ends and another starts it is time to take stock and assess what were the hits and misses of the year. In which areas we excelled and where we faltered. Continuing with the tradition of Yesteryears the Gemstoneuniverse Team has selected the 10 best reviews of the year 2015. On What basis were these reviews selected. Even though there were a multitude of reviews the entire motive of this exercise is not self praise, marketing or boasting. 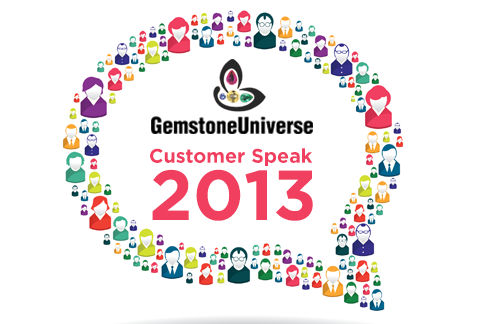 It was a difficult task where generous patrons have given detailed insights about Gem Therapy and Gemstoneuniverse. The only criteria for selection was whether the review has a message that is helpful and insightful for the end user and whether there is a great tip/advice/ suggestion in the review that Helps people understand the true Message of Do Gems Work- No They do not for 90% of the people and do a 100% error Free and rewarding Gem Therapy that is measurable and quantified. For Example, The review by Mr. Lucky Strike is amazing because he himself went to several shops and vendors and saw several gemstones and compared it with his own research before implementing Gem Therapy. That is something all of us can benefit by. His review was a great learning for us at Gemstoneuniverse also. Another great review is by Sharat, who gives the most remarkable insight about Gem Certificates. We think all can benefit by the research of these Patrons. Where are these reviews from? Out of the 10 best selected reviews, 2 are video shares with Patron Names and Designations. Thank you dear patrons; it takes tremendous courage and grace to share something publicly on Video and facing the camera. 4 reviews are from Trustpilot- an independent review platform that lets you write a review after validating the customer invoice and 4 reviews are from Gemstoneuniverse Testimonial/ Feedback section. Here are the Top 10 Gemstoneuniverse Reviews of 2015-2016 that are most insightful and with the best learning’s and tips. Reviews from Trustpilot (To view all Gemstoneuniverse Reviews at Trustpilot Please click here). These reviews are reproduced as is without any changes in grammar, spell check, formatting or our comments/ take on them. Exhaustively Knowledgeable on their subject, Transparent, Precise, Quick and Very Efficient. I rarely write reviews. But for GU anybody have to do it!!!! First and foremost Total and Absolute 5 Stars on all fronts to GU!!! I came across Gemstone Universe website by absolute fluke on Monday 13th July 2015. But, after reading the several informative articles on GU’s website, I am confident that it was no fluke and my Karmik Map made me land on this website. I was browsing the Internet trying to find out where I can get information about Gem Stones. After landing on GU’s website I started reading the articles on their site which I found very informative, interesting and most of all transparent. It is like an encyclopaedia in there (and I kid you not on that)! As a family our total belief on Gem Stones and its recommendations for Astrology purposes was shattered with our previous experiences. But, after reading GU’s article “Do Gemstones Work – No They Don’t for 90% of the People” (which we think is a very very honest and wonderful piece of work), we could relate to everything that had gone wrong regarding our Gem Stones and its recommendations for Astrology purposes. After reading the same we recommended it to more than a dozen of our known associates and boy everybody was totally awestruck and in praises about the article. ABSOLUTE HAT’S OFF TO THIS ARTICLE!! After reading the above article it made me crave for more, but, when I saw the sheer volume of the articles, it immediately it struck me that it is not a one day job and hence I made it a point to surf the website for 40 minutes daily and after 14 days i.e. 560 hours of reading GU’s various articles and surfing their website I sent my 1st query to them on Monday, 27th July 2015 at 21:01 hrs and as you would expect I immediately got a reply on the next day at about 10:18 hrs. To be honest to start with, I found the initial communication to be too direct, curt, terse, clipped and monosyllabic. What I got in reply were some links and I thought.. “Really are you kidding me”! However, I realized very shortly after going through the links and subsequent communication that my collected information of 560 hours was also very limited and the suggested link answered my questions absolutely to the point. The resources on the Gemstoneuniverse website i.e. the various Articles, Videos, Blogs, Write Ups, etc. are huge and answers almost all queries. I ordered our first 2 Detailed Gemstone report on 26th August 2015 and both the reports were received by us on 4th September 2015 i.e. in 8 days as promised. We were totally blown away when we started reading the reports. They were very exhaustive, detailed, clear, to the point and where necessary references to the particular Verses, Chapters, Books, etc. of our ancient astrology texts were given. Nothing was on the lines that we (GU) are saying it and hence it is correct just believe it. The reports clearly explained which gemstones were to be used by us, since when, for how long, it’s alternative (i.e. Up-Ratnas), their Carat Weights, etc. etc. We would highly recommend this Gemstone Analysis Report to anybody who intends to start a Gem Therapy irrespective of whether you buy the Gem Stones from GU or not. Then we ordered another 2 Gem Stone reports on 30th September 2015 and 8th October 2015. And finally we ordered our 10 gem stones on 21st November 2015. We ordered a consignment of 10 Gem Stones on Saturday, 21st November 2015 at 09:44:00 hrs. The 10 Gem Stones were to be consecrated in different names. What impressed us the most was, our consignment was despatched from GU’s office on 23rd November 2015 at 20:17:59 hrs i.e. within 60 hours (that too including a Sunday). That’s real “Godspeed”. We received our package on 26th November 2015 i.e. in 5 days from our order. Each Gem Stone was packed in a small plastic box with foam in it and then sealed from all the 4 sides. Each stone’s identification nos. etc. details was written with a Permanent marker on the back of the small plastic box. These small plastic boxes were then packed in a plastic lock bag according to the names of each person for whom it was consecrated. The plastic bags were then wrapped in a bubble bag to absorb shocks etc. and placed in a wooden box and the box was completely sealed with GU’s imprint. All Certificates, Invoices and other papers were also packed in different lock bags as per the names of each person for whom it was consecrated. All in all a very clear, distinct, easy to relate and immaculately done packaging! We were absolutely mesmerized by the stones and they were much better that what is seen in the HD videos also. It was absolute “Love at First Sight”. We immediately took the stones to our bench jeweller on 27th November 2015 to make the rings. Till the 4 hours we were their finalizing the designs of our rings the owner, their representatives who were dealing with us every body complimented us more than half a dozen times on the stones. Even few customers asked our bench jeweller to give them these kind of Gems and we were extremely happy to recommend GU to them as well as our bench jeweller. I think this itself speaks volumes about the quality of the stones. Customers are like GOD to them, excellent support, took care of all our queries in a jiffy, provided timely and helpful advice regarding the numerous queries which we had before purchasing the Gem Stones (Kindly note that we sent out our 1st query to GU on 27th July 2015 and ordered our 10 gem stones on 21st November 2015 i.e. in this 3 Months and 25 Days our different queries were answered). They let us knew all the important information regarding not only the Gem Stones but other things relating to that viz. Astrology, Gem Therapy, Pricing, etc. etc., extremely attentive and listened to all our concerns with a great deal of patience, also ensured that we receive all the information regarding the mode of payment to the company and the time by which we would expect the delivery, also solved the problem regarding the duplication of Shipping Charges which we faced, also took care of the 2 Hessonites we ordered 1st, which were wrong and replaced them with the correct ones without any hesitation. Customer Care team has a caring approach and are true professionals. We give 5 stars to their customer service. They deliver what they promise without compromising on any aspect. We were able to make our decision and purchase with in depth understanding and knowledge. Overall our purchasing experience was extremely satisfactory. If you are looking for Astrological Gemstone, then, GEMSTONEUNIVERSE.COM should be your first and last stop, rest be assured! We would recommend GU not just for the best price or quality, but their sheer dedication to Gem Therapy and it’s implementation in its totally Natural and Vedic form as described in our ancient texts and last but not the least to their ultimate focus and intention to see their clients get results. GU was a hidden gem for us before we found it and we can assure you with confidence that whether you are looking for a gemstone for jewellery or the perfect Astrological Gem as per the horoscope, this is the place to go. THEIR WHOLE PACKAGE IS WORLD CLASS AND CANNOT BE BEATEN. The kind of quality and service received isn’t very common in this day and age. Top notch service from start to finish. We would highly recommend this company to anyone! We will purchase again that’s for sure and also tell others to do the same in our circle. We are extremely satisfied with our dealings with them till now. Hope these people keep the same maintained in future too! We will be receiving the rings from our jeweller on 22nd December 2015 and we will write a review 3 months after we start wearing the rings. My experience with Gemstoneuniverse started with me knowing nothing about gemstones even though I have seen many people wearing navratna rings. Six months ago I started to learn vedic astrology just because it fascinated me. I wanted to know the reasons why certain events were happening with respect to my life and after long and deep research I could understand why certain events such as accident, foreign travel, etc. occurred during a particular period from my birth chart and planetary transits at that time. In effect you could say that I turned from believing vedic astrology as ‘pseudo-science’ to something which is ‘super science’. Then came my encounter with an astrologer based here in UAE who prescribed gemstones as per my birth chart and was trying to sell it to me for specific weight such as in rattis, etc. I was not sure whether to buy those gemstones since I’m always sceptic about the originality of these especially being wary of businesses that just look for profit which is becoming the trend in this yuga. I went to different reputed jewellers and the prices for yellow sapphire and red coral (which were recommended by the astrologer) were always different. My inquisitive nature got the better of me and I decided to research on gemstones and find out the reasons why I was recommended the particular stone and that brought me to Gemstoneuniverse. I read many articles and got enlightened about the gems business and one particular article written on the site mentioned the difference between an astrologer who sells gemstones (in this case the astrologer may be genuine but the gemstone will just be his money making way and mostly synthetic) and an astro-gemmologist (all of gemstoneuniverse consultants). Also I learnt that most of the gemstones that reputed jewellers sold were indeed natural but they never mentioned if it is thermally treated or not in that particular stone’s lab certificate. Then I understood that jewellery businesses worldwide have accepted heat treatment as part of gemstones to improve its look wherein it loses its jyotish quality. So all you people out there just see the certificate of the gemstone from the jewellery and if you do not see any mentioning about thermal or heat treatment, you can be rest assured that it is indeed thermally treated This experience ignited my belief in Gemstoneuniverse and I ordered their 15$ report from the site. While the report was being prepared by the Gemstoneuniverse team which they promised would be sent to me in 7-10 days, I decided to read my chart and see if I could come close with the recommendation of gemstones for myself and guess what, I got yellow sapphire and Ruby recommended by the team which was what I predicted myself (using the anukul-graha concept followed by PGA) so it gave me a kind of confidence that I too have some skill in astrology. Anyways my self boasting apart, I ordered the yellow sapphire ring (hopefully the Ruby ring as well one day) and I received it in 21 days from the date of order and I am very excited to start wearing it on an auspicious date as per the team’s instructions. I believe that the positive effects will be witnessed once I start wearing it and will get back with further feedback. Trust in Gemstoneuniverse and their customer service which is top notch and be ready to be astonished. Hope to be associated with this organisation for life. Thank you. Being in the USA in insurance business for past 30 years I have many relatives, friends as well as clients in Gemstone and Diamond business-big and small. This is a complicated difficult field and information is not readily available. However I recommend Gemstoneuniverse not just for the best quality or price but their sheer dedication to Gemstones and their ultimate focus to see their clients doing well and getting results. Gemstoneuniverse was a hidden gem for me before I found it and I can assure you with confidence that whether one is looking for a high end gemstone for jewellery or the perfect Astrological Gem as per the horoscope, this is the go to go place. Their whole package is world class and cannot be beat. I have referred many of my known people to them and all of them have something similar to say. I could not find a better gemstone or service or price anywhere else. GU has a very professional approach to their services right from the stage of gemstone recommendation report to the delivery of a product. Also the quality of the products are absolutely fabulous as despite checking at other places, websites or shops we can’t but finally settle on purchasing them from GU only as we find it to be ‘the only one stop shop’ solution, simply because the people who recommend the products exude thorough knowledge and experience in the subject, highly professional attitude and approach and also the products come with authentic and necessary representations and certifications and not to mention the buy-back provisions which is really uncommon in this field that adds more authenticity to the whole deal. We have purchased one semi precious (white coral) and one precious stone (Ruby) that were delivered abroad. The entire process was fast and smooth and we were absolutely happy with the products and service both. Any number of queries (mostly on email and a few telephone calls too) w.r.t the reports or products have always been spontaneously and satisfactorily answered. I believe that the great levels of satisfaction and positivity that was felt by us, when we first looked at the stones after we received them each time, is what matters most and is the first step towards realising our hopes and expectations, for which we resort to this therapy. Rest assured, we are now looking forward to achievement of the intended success for which the gemstones have been purchased. We hope GU continues to deliver such unbeatable quality of products and services even in the future and also certainly look forward to our continued association with GU for our future purchases for ourselves as well as our other family members. “ GSU Team provides an extra-ordinary service and their faithfulness is note-worthy. My first experience with GSU was with the Vedic Gem Report. With the said recommendation , I bought the Moonstone (upratna for Pearl) from them and could observe it’s effects on me within a month’s time. it really brings some calmness in thinking/thoughts and brings harmony in the domestic relationship. My second experience with GSU was when I visited the store at Bangalore to buy the other recommended stone – Yellow Sapphire. What I felt there was that it’s more of a spiritual organization who are willing to help/advice you rather than a Business House selling the Gemstones. After wearing the Yellow Sapphire since 2 weeks , looks like my dream of working in a foreign country is coming to be true. Thank You! Thank You! Thank You! So these were the top 10 reviews as per our selection. 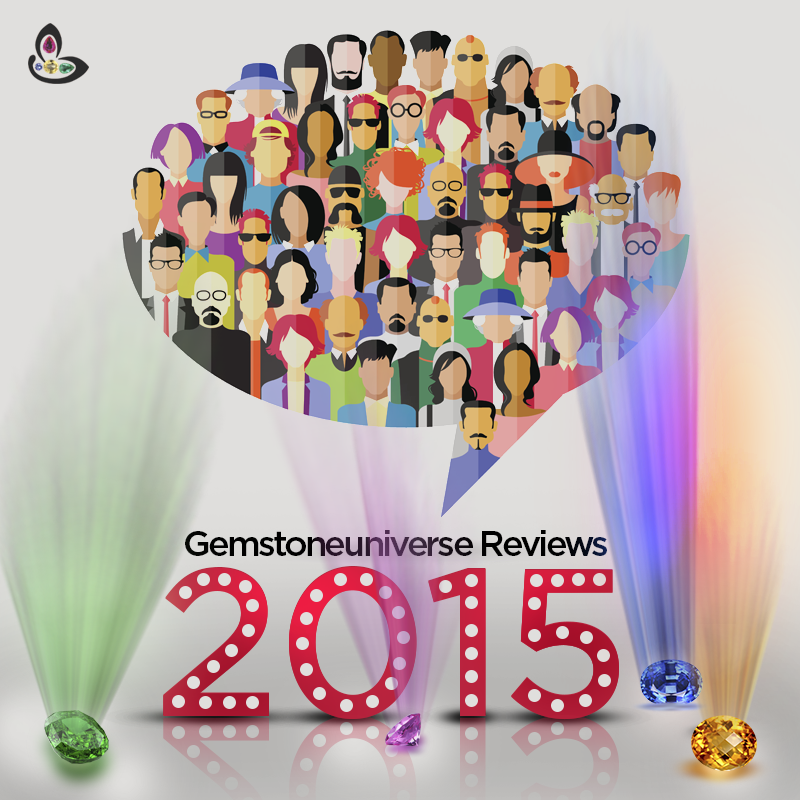 You can view multitude of Gemstoneuniverse reviews and who knows what clicks for you. One man’s simple word or a phrase might affect your Karma Positively. We at Gemstoneuniverse thank all of our Patrons who have given reviews. We appreciate the fact that you took time out and shared your experience and several others benefited from your insights, thoughts and experience. We Wish you a great 2016. May the divine bless you with health, wealth and happiness. Deo Amabiles Et Hominibus- Pleasing to God and to Men. It was a great year for us here at Gemstoneuniverse. We connected with you, shared with you, heard from you and learned from you. It was great to interact with you all over the year on our Facebook Page and you made our Page vibrant, lively and rocking. At the time of writing this piece( 31 December 2013) we have 66316 fans on Facebook, 4468 talking about the page and 147 checkins. Do join us at the Gemstoneuniverse Facebook Page. We would love you have you as a part of our lively community. We are, because you are. Here are top 10 customer reviews of 2013. 5 Reviews are from Trust pilot– an independent review website where you can review a product or service using your invoice and 5 reviews are from Gemstoneuniverse customer testimonial section. Gemstone Therapy is very powerful and incredible. I appreciate Gemstoneuniverse for they will make you a recommendation only if you need it. Case in Point, Both Me and my wife ordered a Gemstone report. I was recommended no gemstones and it was clearly stated why I did not need any Gemstones. However she was recommended a Yellow Sapphire and Red Coral and we implemented that for her asap. I can say from our personal experience that the Gemstone energy was very powerful and most of the objectives mentioned during the consultation have been met. It is actually awesome to see her make rapid improvements in her health and general well being. Both rings are gorgeous and gemstones are top quality. The finesse of workmanship, the hallmarking, the transparent invoice in which everything is exactly mentioned including the Gold Calculation etc are all excellent. More than anything else we are happy with the results. Gemstoneuniverse is trustworthy and Its just not the Gold Standard in Planetary Gemology it is “The Only” standard in Planetary Gems and Gem Therapy. I am sure other Gemstoneuniverse clients and patrons will have the same thing to say. One Humble Piece of Natural Jyotish White Coral costing $250 with a fantastic advice did what years of therapy, medication, God men and prayers could not do. There is nothing more magical than this. I thank Guruji Shrii Arnav and the Gemstoneuniverse team for blessing me with something that is so life changing. I was lucky to have come across this website, planetary reading of the horoscope by Shri Arnav Ji was perfect and so were his gem stone recommendations. Team at Gemstone Universe was prompt in clarifying my points and the service was absolutely professional. I can say from my experience that there are multitude web sites offering Vedic stones therapy but with Gemstone Universe One can be Assured of a Perfect Personal Recommendation with Genuine Quality Gem Stones with a variety of options to select. Their website is very user friendly and easy to navigate and so is their service. I highly recommend to all those who are inclined towards Gem Therapy than don’t look anywhere else but Gemstone Universe. 1) When I sat down at the table where they show the Gems- a Gemologist first greeted me and introduced himself by showing me his id card from the prestigious GIA School and said He would be attending me today. This made me very comfortable. 2) Their focus is fantastic and attention to detail to give the best to the client is also excellent. Above the Table there is a light system (Sorry I am no Gem expert so I don’t know what exactly its called), that lets you view the Gemstone as it would look inside the room in artificial light and then they switch it over to show the gem exactly as it would look like in normal sunlight. This was absolutely a new experience from me. I have purchased some Diamonds for my wife and mother but none of the places had such facility. The Gemologist explained to me that the lighting system is to give you the best possible view and that Emeralds should never be bought on a cloudy day as they look more beautiful than they actually might be. The light system that replicates true sunlight completely takes away all these factors. All in all a new experience and a wondrous one at that. If you are really into Gemstones or want to wear Gemstones for Luck then this place is it! 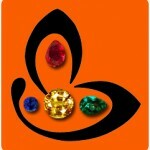 I had a great experience with Gemstone Universe and would happily recommend them to my friends and relatives. I wanted to try out gemstone therapy and stumbled upon their website only recently while doing an online search. I decided to get their gem recommendation report and wasted no time ordering what they recommended. What I like about GU is that they have a wide range of inventory and it’s easy to find something that serves your needs as per your individual taste and affordability. The staff of astrologers here are awesome — I got a chance to talk to an astrologer over the phone after their gem recommendations, and he was warm and open to my queries and concerns. They really tell like it is, instead of persuading you to buy expensive stuff. The gemstone rings shipped(overseas) and arrived on time and they follow up with you through that period. I’m impressed by their professional yet warm approach to their business. I have stopped short of giving the 5th star because I have just begun to wear my gemstones and can’t comment on their effectiveness just as yet. But I’m quite optimistic and trusty about their products and I hope I continue to be their happy customer in the years to come. Note: Mr. Antony has given the same testimonial On Trustpilot. “ Thank you all at Gemstoneuniverse for making my Gem therapy memorable and cherishable. Your dedication and attention to detail is admirable and the way you just handle the gemstones while showing to your patrons speaks of the tremendous love and respect you have for the Gems. I thoroughly enjoyed the visit to the store and the interaction with some of the team members enriched me. I have got good results from my Cat’s eye already. I wish you all the best in life and I hope that Planetary Gemology shall reach new heights with your knowledge and dedication. “ This was my second fab experience with Gemstoneuniverse. It delivers what it promises.. its not a gem shop or store.. its a brand.. Honestly, i am extremely happy with all the three gems i bought. I never miss to see them when i wake up.. Its clarity purifies my mind.. graced for being a part of this family and pretty sure that many experiences are waiting in the days to come… Thanks Raghav..thank you Gemstoneuniverse..
We would like to thank Mr. Rajkumar Tulshyan for his reviews and feedback. He has enabled positive Gem Therapy for a lot of individuals and shared some of his personal experiences on Camera, his gracious action speaks a lot of his courage, humility and the wisdom to share the divine knowledge. Wish you a very happy 2014 and may you be blessed with health, wealth and happiness. Admin Note: The Reviews featured above are has submitted by the patrons without any edits for grammar or spelling. 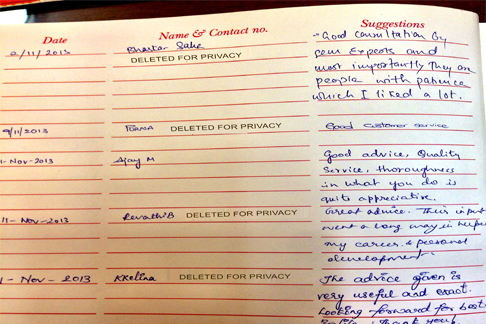 And Here is a snapshot of the Guestbook at Gemstoneuniverse Centre of Excellence-The world’s largest facility of Planetary Gems. © Gemstoneuniverse- All rights Reserved. When a person uses the gem for planetary gem therapy with absolute faith, the gem becomes the elixir of life, the sea of possibilities and the gateway to realisation of latent potential. And the effect of the tremendous raw, unadulterated energies inherent within the gems is undeniable. The effect of a pure, rich energy of a planetary / jyotish gem can work wonders when it interacts with the human energy system. Here it is for you, straight from the heart of a patron – Mr. Ramesh Varadrajan, a software professional, who shares his enriching experience with jyotish gems – white sapphire, Blue Moonstone, Organic Red Coral and Yellow sapphire. It is phenomenal to see the understanding of the quality and knowledge for gems, grow rapidly in patrons through experience. What a good upratna or a substitute gem, can do is also mind-boggling. It is an absolute reward for Gemstoneuniverse when patrons experience great results and more so when they are willing to share that with the world. ©1999-2013, Gemstoneuniverse.com, All rights reserved.